Troubled insurance giant AIG, already under fire for intending to pay out $165 million in bonuses and compensation, succumbed Sunday to congressional pressure, identifying banks that received chunks of the company’s billions in federal bailout funds last year. 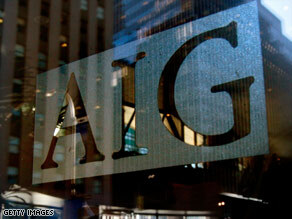 AIG PayoutsBelow are the top 10 largest payouts, according to a report released Sunday by AIG. Officials from the Federal Reserve and AIG have resisted disclosing the identity of the banks, citing concerns about competition and confidence in the market. Responding to questioning about AIG on March 5, Fed Vice Chairman Donald Kohn told the Senate Banking Committee that revealing the names of the banks would prevent financial institutions from doing business with AIG and other recipients of federal bailout money. “They would draw back from doing business with those folks,” Kohn said. Kohn’s comments drew scrutiny from the committee, namely chairman Sen. Chris Dodd, D-Connecticut, who replied, “Right now the public is deeply, deeply troubled by all of this. And it’s their money that is being fed into these operations, and they, frankly, don’t understand — nor do we — the legal arguments you’re giving, but at a time we need to engender public trust and confidence in these very difficult steps, that kind of an answer undermines that effort very significantly.” AIG, in its statement Sunday, said it consulted with the Fed about the benefit to the public of disclosing the counterparties, and whether doing so would cause “competitive harm.” Watch report on AIG naming names » The company also faced criticism over the weekend from White House officials and some congressional lawmakers who reacted strongly to news that AIG had intended to pay out $165 million in bonuses and compensation. AIG bonuses spark outrage in D.C. Under pressure from the Treasury, AIG scaled back those plans and pledged to reduce 2009 bonuses — or “retention payments” — by at least 30 percent. That did little to temper outrage at the initial plan, however. In a letter Sunday to Treasury Secretary Tim Geithner, U.S. Sen. Russ Feingold urged the Obama administration to explore “legal options” to prevent the millions in AIG payouts. “I write to ask why any bonuses would be legally required, given the company’s abysmal performance,” said Feingold, D-Wisconsin. Also Sunday, CBS’ “60 Minutes” aired an interview with Federal Reserve Chairman Ben Bernanke, who said the AIG bailout rankled him. “Of all the events and all of the things we’ve done in the last 18 months, the single one that makes me the angriest, that gives me the most angst, is the intervention with AIG,” Bernanke said.” AIG lost a record $62 billion dollars in the fourth quarter of 2008. It has more than 74 million insurance policies issued in 130 countries around the world.